AVI is a multimedia container format that is quite popular. Without doubt, AVI has its own advantages like easily holding all kinds of different video qualities, excellent compatibility, etc. But sometimes, it also can't be adopted by some players and devices since AVI doesn't provide a standardized way to encode aspect ratio information, doesn't apply any compression technique and more. Therefore, some users will need to convert AVI to/from MP4, FLV, MOV, etc video formats for special use. In this article, we list top 4 Mac AVI converters for your consideration, just keep on reading. It is a tough work for inexperienced users to figure out a suitable AVI video converter for Mac among thousands others. Here we introduce you the best Mac AVI conversion software in conversion function, speed, output quality, ease of use, price: MacX Video Converter Pro. Honestly, this AVI converter Mac can completely cater to your needs when converting AVI files with its diversified features. Easily convert 8K/4K UHD, MKV, AVCHD, M2TS, MP4, FLV, MOV, 3GP and more video files from/to AVI video formats on Mac (macOS 10.12 Sierra included). Decode/encode AVI video files with world's fastest speed due to the built-in QSV hardware acceleration tech. Capable of limitlessly compressing AVI files to smaller size MP4, MOV, FLV, 3GP, etc video formats for compatible with iPhone iPad Android. Original quality reserved. Batch converting AVI files to/from MP4/MOV/FLV Mac is supported. Able to crop/trim/merge and add srt/watermark to the videos. Download AVI videos or download videos to AVI from YouTube, Vevo, etc. Extract audio files from AVI videos with ease. Before converting AVI on Mac, download AVI converter Mac on Mac computer (iMac 5K/4K or MacBook Air/Pro). Turn to Windows version (Win 10 supported) if you are a Windows user. Step 1: Launch this AVI to MP4 converter for Mac and click "Add File" button to load your AVI video file. Alternatively, drag a file or several AVI files into the window. 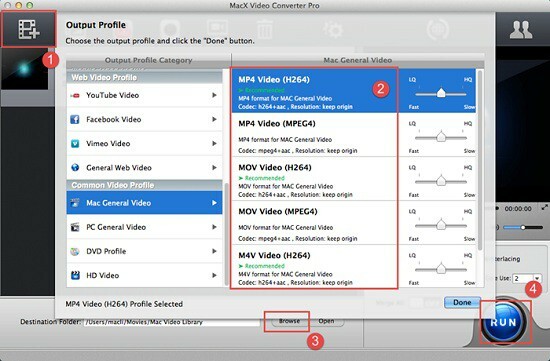 Step 2: Go to Mac General Video and select "MP4 Video" or MKV/MOV/FLV/3GP as the output video format from list (200+ formats and 350+ devices profiles available). You can also adjust the output video parameters, make further editing etc. Step 3: Click the "Browse" button to choose an output folder for saving the converted AVI video files. Step 4: Tap "RUN" Button to start to convert AVI Mac. BTW, those four simple steps are also available to convert MP4 to AVI Mac, convert MTS to AVI, convert MOV to AVI, convert MKV to AVI, AVI to MP4 etc. To be frank, iSkysoft iMedia Converter Deluxe for Mac is one of the best video converters for Mac because of its outstanding video conversion function. It supports to convert all AVI videos to/from SD video/audio formats (MP4, MPG, MOV, FLV, MP3, M4A, AC3, AAC, etc) on Mac. Of course, users are allowed to directly convert AVI to iPhone X/8/7/SE/6s/5s, Samsung Galaxy S, HTC Desire and more mobile devices via iSkysoft Mac AVI converter in order to playback on the move. Besides, other AVI video editing features is a plus, for example, merge multiple videos, capture streaming videos, adjust video aspect ratio, etc. 1. Able to burn AVI videos to DVDs. 1. Price is too high comparing with other video converter AVI. This AVI file converter for Mac is easy-to-use for both newbies and experienced users and can easily deal with many AVI video conversion tasks. 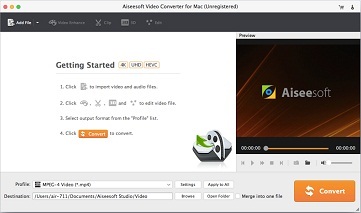 To be specific, Aiseesoft AVI video converter for Mac has the ability to convert between all SD/HD video formats covering AVI, MP4, MKV, MOV, FLV and more video formats. Certainly, it presets a majority of output profiles for Apple Android devices and other portable devices. Last but not least, this 2019 AVI video file converter Mac owns powerful video editing features like trim video, crop video, merge several videos segments into a new one and more. 1. Can convert 2D video to 3D video with multiple 3D options. 2. In addition to converting AVI to WMV/MKV/MP4/3GP, AppGeeker AVI to MP4 converter Mac also can convert AVI to various audio formats like AAC, MP3, OGG, FLAC, etc. 1. Unable to download videos from YouTube, Vevo, Vimeo, etc free online video sites. Serving as a versatile Mac AVI video converter, Movavi Video Converter for Mac provides users the simplest solution to convert videos to AVI or convert AVI to MP4, MKV, MOV, FLV, WMV, iPhone 6s/5s, iPad Mini, HTC One M9 or even some popular online video formats for trouble-free uploading to YouTube, Vimeo, Vevo, etc sites. Surely, many bacsic video editing functions are included: rotate, flip, crop, add subtitles, adjust video parameters and more. 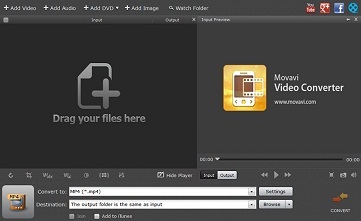 What's more, Movavi AVI converter Mac enables users to freely convert DVD to AVI for replaying on mobile device. 1. Superfast conversion speed due to the application of the powerful conversion engine. 1. Can't download online videos.